The Fitness First Team is proud to support the Raelert Brothers, Andreas and Michael, in preparation for 2013 Championships. Both Andreas and Michael are training for the IronMan Championships in Hawaii this year, and Michael will also be taking part in the event in Las Vegas too. In order to get in the best possible shape to take part in these gruelling events which are extremely physically demanding, the brothers have chosen to train at Fitness First, which provides them with a good and comprehensive workout. 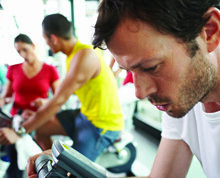 Fitness First is one of the largest fitness and health operators in the world with 380 Fitness First clubs in 16 countries. In Germany, Fitness First runs more than 80 clubs offering their 270,000 members the perfect balance of training, recovery and nutrition. Here everyone has the possibility to achieve their goals no matter their age, shape and fitness level. Our members can choose from various offers including weight, cardio and other small equipment, as well as up to 40 different group exercise classes. Some of our clubs also benefit from rich wellness areas, pools and child care facilities. Whatever you want to achieve, we will enable you to reach your goals! You want to lose weight, tone and/or strengthen your body. You want to increase your endurance and build strength. You want to live a healthier lifestyle and improve all round well-being. You have a specific sporting goal which drives your workout. Choosing from one of these major goals defines the basic focus of your training and the composition of the exercises. We understand that everyone is different and it is for these reasons, that as part of your check-up programmes with one of our highly trained fitness coaches, we will help you to identify your personal targets. In cooperation with the world champion, medicine and nutrition expert Mark Warnecke Fitness First has developed and integrated an effective nutrition concept into your training. Attention all triathletes! Save €50 and receive a free 30 minute personal training session by entering the „raelert brothers“ when joining Fitness First. This offer is only valid for new members until February 28th, 2014. If joining in club, please print out this page and bring it with you to the club.